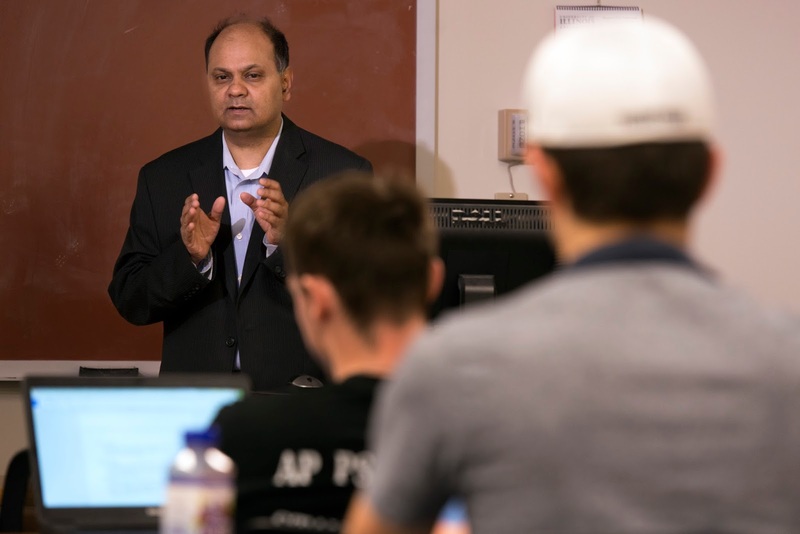 University of Illinois Springfield Associate Professor of Political Science Ali Nizamuddin, Ph.D. is using current events to encourage discussions of potentially polarizing issues among his students. “What I’ve tried to do in the classroom is bring together a diverse range of students, not just diversity in terms of ethnicity, religion or language or background, but disability as well. It means ‘the way I look the world is very different,’” he said. Nizamuddin teaches a range of courses within the political science department and often has students from China, India and African countries in his classes. “That really helps when you have this setting, where each (student) is trying to share that person’s experiences, and contributing to the classroom,” he said. Nizamuddin said he tries to have diverse discussions in all of his classes. He begins by teaching students to approach controversial topics with the premise that the other side is right. Nizamuddin said he does not suppress opinions that could be construed as racist, and that he teaches and also requires an etiquette of disagreement. He said the more intimate class size on the UIS campus lends itself to meaningful discussions and debate between students. “It allows me to benefit and learn from them too,” he said.